Something interesting happened to me yesterday. LinkedIn did something very smart. I know, how amazing is that? But, then almost immediately, true to form, they followed it with something equally stupid with Push Notification User Engagement in their mobile app. There are mobile marketing lessons here around how to cleverly engage with mobile app users. Something that will drive up user engagement and ensure that push notifications are enabled AND stay enabled within your app. Here’s what happened to me to illustrate this. 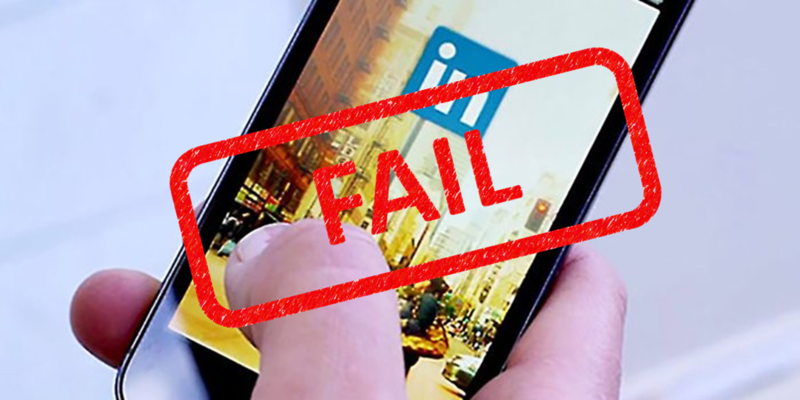 I use the LinkedIn mobile app most days, like a lot of people. It’s not great, but it does the job. A while ago, I switched off Notifications. I doubt I am the only one that has done this. It was just too noisy and interrupting me by firing numerous low value notifications throughout the day. Lesson 1 – Think carefully about how you communicate with users. Over communication or low value communication can be more damaging than no communication at all. So here comes the good bit. Yesterday I was using the message feature in LinkedIn. Just as I was closing the app it prompted me with a message that asked if I wanted to be notified if “John” replied to my message. It was a good conversation. So, of course, I wanted to know as soon as he replied. So I responded yes. Genius move from LinkedIn. They are encouraging me to opt into Notifications by showing the value of me doing it with a highly targeted, highly relevant message. It’s not the bland request you often get, “Do you want to receive Push Notifications”. Very smart. But then it all goes wrong. Instead of allowing me to subscribe just for notifications from Messages in my Inbox, they turned the fire-hose on me, bombarding me with general notifications AGAIN. LinkedIn – I don’t really want to know someone’s birthday or whether they have changed job. That’s why I opted out in the first place. So what do I do. You guessed it. Notifications are off. Lesson 2 – If you offer something of value, then deliver on the promise. What LinkedIn should have done is what they promised and only subscribed me for notifications from messages. That’s what was value to me. The funny thing is it’s easy to do. All their mobile marketers needed to do is have a Channel in the push notification service that’s dedicated to Notifications triggered from new messages or replies in my Inbox. Kumulos (named a top push notifications service by Business of Apps and The Tool) allows you to do that and I am sure that other services would also. With a little more thought from LinkedIn they could have easily given me what I want. Instead they were lazy and opened the notification flood gate on me. Within LinkedIn someone somewhere came up with the genius idea of using highly relevant, timely and highly targeted notification to increase the recency and frequency of their app users. EXACTLY what they and every other serious mobile app owner should be doing. This would have encouraged me to use the app more often during the day and be able to respond quickly to a message while someone was logged into their LinkedIn account. Lesson 3 – Relevance is key with Push Notifications. Uses Channels to give the user what they want, not what your KPI’s say you should achieve. Someone, no doubt had an objective to improve engagement and drive up the ratio of users opting in for Push Notifications. Again a sensible objective to have. But they didn’t think it through. With a little more effort they could have increased the value of the app for me and secure me as a highly engaged user. I am guessing I’m not alone here. So in summary, Push Notification user engagement is important. When done correctly, you can increase retention with push notifications. If you want users to be engaged with your app and be in your app frequently Push Notifications are one of the most effective weapons in your armoury. They can add huge value to your app itself by in this case allowing the user to respond quickly to messages. On the flip side of the coin they can equally as easily destroy value if they are used crudely. Encourage users to enable Notifications by showing them the value it will create for them. Don’t then use this as an excuse to then bombard them with unwanted interruptions. Think through what users want from the Notification Service and give them the ability to subscribe for what’s relevant to them, especially if the smart opt in message sets that expectation with them. The Kumulos Push Notification platform lets you offer a push notifications service to your clients to increase engagement in their app. Alternatively, give your clients control with an easy-to-use, branded Push Notifications Mobile Marketing Automation Portal where they can create campaigns and view results. Either way, Kumulos lets you offer more. So you stand out from the crowd and win more projects. What’s more we help you maximize the life-time value of your clients by keeping your customers close, so it’s you they come to for follow on projects. Take a 30-day free trial today and see how easy it is to drive up mobile app user engagement using push notifications.